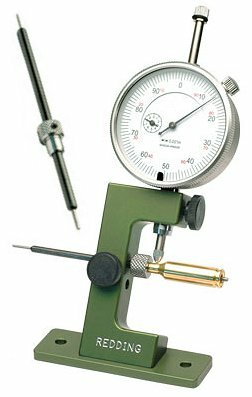 Every precision reloader should have a quality tool for measuring case-neck wall thickness. This is essential for those who turn necks–to check the results of your turning. Even if you prefer no-turn necks, a case neck gauge lets you check your neck dimensions and sort cases by neck wall thickness and uniformity. Consistent neck tension is critical for accuracy–but without uniform neck-wall thickness neck tension is hard to control. The new Redding Case Neck Gauge, released in late April, has many notable features. First, it has an integral base. This can be screwed to a bench-top, placed in a vise, or simply held in place with a clamp. The pilots are stainless steel with a smart design. First, on the inboard end, the pilot is slightly under-cut so it doesn’t give a false reading based on slight imperfections in the case mouth. On the other end, there is a step-down (i.e. reduced radius). This provides extra clearance around the neck-shoulder junction, where a doughnut may exist. With this “smart shape”, the pilot ensures you are getting accurate read-outs of the critical area of the neck-wall. The pilot also rides on a shaft with pins on each end that fit in the case flashhole. This keeps the case centured on the pilot. The Redding Case Neck Gauge (item 26400) ships with two pilot stops, #06121, for .22 caliber and #06130, for .30 caliber. If you use this with a 6mm you’ll need to order pilot #06122 for BR style small flashholes, or pilot #06124 for large flashholes (e.g. with 243 Win brass). The new Redding Case Neck Gauge is available from Grafs.com, Midsouth Shooters Supply, and other vendors for about $65.00, including .001″ dial indicator. Share the post "NEW Redding Case Neck Gauge"
I would think you’d be better off getting a K&M neck turner that has a hole for a dial indicator, that way you have a tool to check thickness and the same tool can also fix it if needed, and they are only $60, just use the dial indicator off of you concentricity gauge.